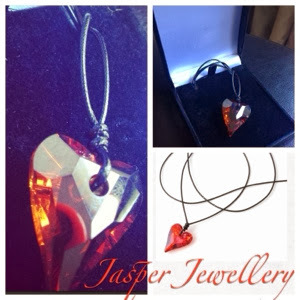 I got asked recently if I'd like to try out an Irish jewellery store called Jasper Jewellery, I was more than delighted to. A quick squiz around their online store and I was happy, lots and lots of sparkles, Swarovski crystals and gorgeousness. I wanted to pick something I could wear every day and I'd be lying if I said I didn't give serious thought to the tiaras. I even had a few outfits I thought would work with a tiara, in a very Amy Farrah Fowler way I got very excited about it but I somehow came to my senses (more's the pity) and thought perhaps I should go for something other than a tiara. 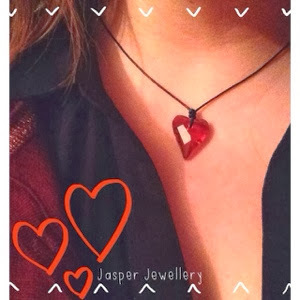 I caught sight of this very pretty crystal heart on a leather cord, I loved it, very simple and striking, exactly what I was after. I put my order in quickly and it was with me within 36 hours! That's pretty impressive. I have to say I love it, it's really striking and unusual and it goes with everything. The cord can be made longer and shorter depending on your style, I've been wearing it quite short, the 90s are very trendy at the moment, hello cord necklaces, does anyone else remember Jared Leto in My So Called Life with his cord necklace (be still my heart). I've been wearing it a lot and I love it. Genuinely couldn't ask for better service and it's adorable oh and you have to check out their new Swarovski Christmas jewellery, I die, really.